Yesterday wound up being VERY busy. Another old friend was passing through London -- my pal Dina, from the Peace Corps. I last saw Dina in 1992 -- even earlier than my friend Carolyn, who visited a few weeks ago. I wasn't sure I'd even recognize her when we met up at the British Library. But of course I did, right away, and we went to lunch (with her 80-year-old mother, who was traveling with her) and had a great time catching up on our lives. We went to a restaurant near King's Cross where I ordered pulled pork -- and when it came, that's all it was. A bowl of pulled pork. No bun, no fries, a minuscule serving of cole slaw. It would have been a very weird lunch, except that Dina's mom didn't want her hamburger bun so I wound up with it. At least then I could make a sandwich. 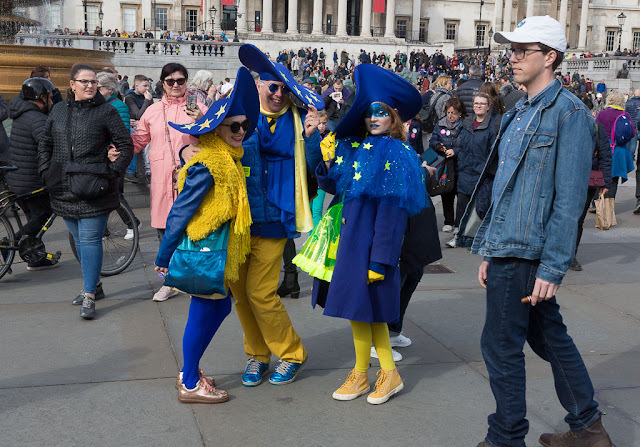 After lunch I took them to Trafalgar Square to see the big Brexit march. 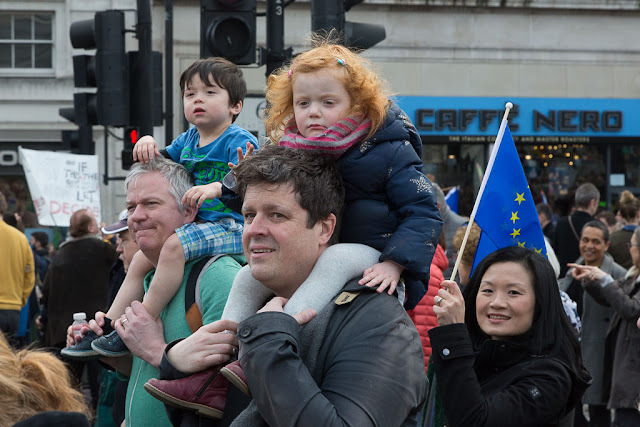 I really didn't want to miss this event, and we even marched for a little while -- but the crowds were so big that the procession was moving very slowly, and I was a little concerned that if we got down toward Parliament we'd be gridlocked and unable to get out. So I mostly just took pictures. There were lots of interesting characters out and about! 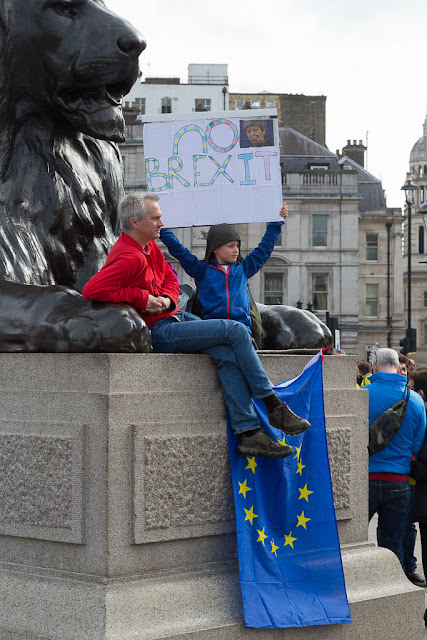 And also lots of everyday people, showing their desire for a new vote on Brexit. 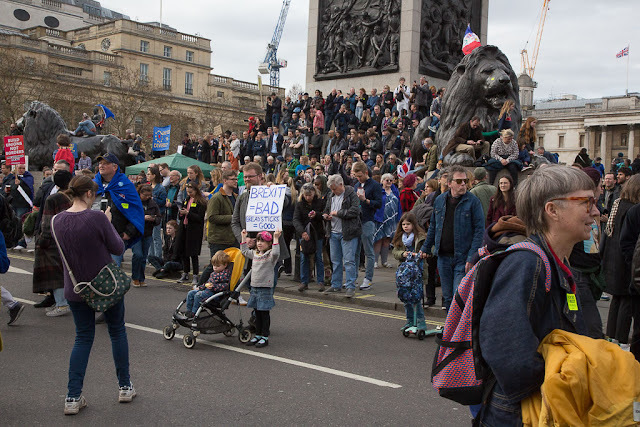 News reports say there were about a million people there -- one of the largest demonstrations in London's history. 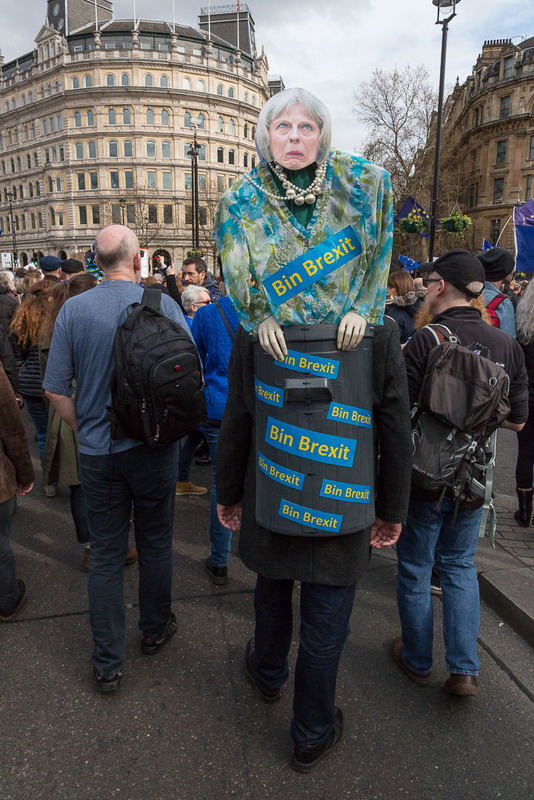 The costumes and signs were very creative! We peeled off the march and went back to the National Gallery, where we had coffee in the cafe. Dina and her mom decided to check out the museum and I came home, exhausted! No holiday is complete without joining a massive political demonstration. Welcome to The Netherworld, sometimes known as Brexitylvania or The DisUnited Kingdom. Britain sure knows how to throw a protest march. It looks so...charming! It would be so easy to just have another vote you'd think they would just do it. I'm so glad to see so many people motivated to get out there and march. What a grand way to reconnect with an old friend and her mom. I'm not sure what's going to happen with Brexit. that was a major march. Wow, I didn't watch the news last night so I didn't hear about that demonstration. It looks huge and if there really were a million people out, it was huge. I can't imagine serving pulled pork without any bread of any kind. How strange. It will be interesting to see what happens next both here and there. Knowing when to stop and have a cup of coffee is a skill. Wonderful coverage, Steve. 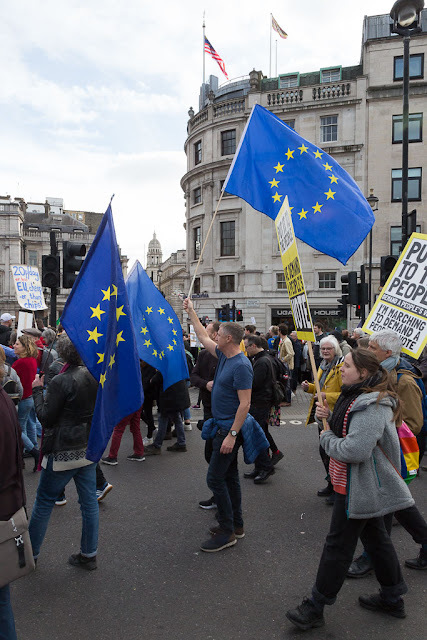 I saw nothing on our evening news about the march. Only endless pundits talking about how they knew nothing about the Mueller report. Bah! Way to go, to give bodily support in favor of sanity. I saw photos of the march and couldn't believe my eyes. How can this not change the course of history?? Man! I want to have that much energy when I'm 80. LOVE the french cheese sign. 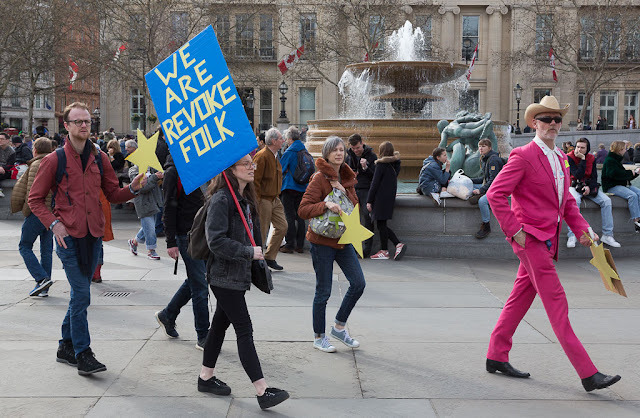 I am always amazed and amused at the inventive signs and slogans that some people come up with at these kind of events. Not just at this march, but at any march - protests, pride marches, rallies for all sorts of political or social justice purposes. 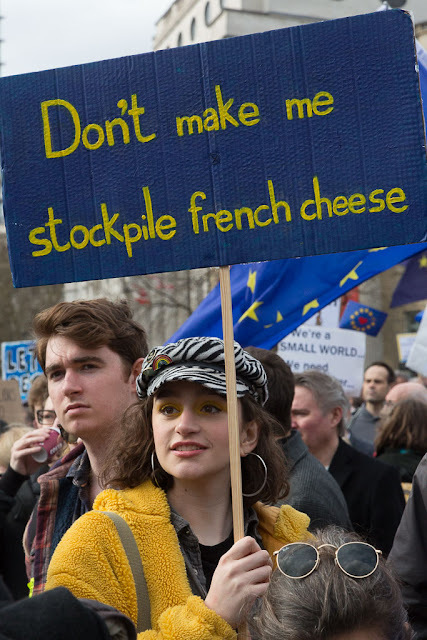 Even something simple as 'Don't make me stockpile French cheese' makes me smile. Gets the point across! Dina's mom must be in good shape! I'd be exhausted like you. It will be interesting to see if the march changes anything. The guy in the PINK SUIT! This is the week---what do you think will happen, Steve?